For your Saturday browsing, here’s a little bit of embroidery history relating to World War I. Over on The History Blog, you can read the complete story of an altar frontal stitched by soldiers during World War I as they recovered from war injuries. Because handwork was (and still is!) therapeutic, during World War I, the Royal School of Needlework organized the embroidering of an altar frontal for St. Paul’s Cathedral. It was stitched by 133 soldiers recovering in hospitals in various parts of Britain. The altar frontal was designed in five panels, and then eventually the panels were united into one piece and hung on the high altar at St. Paul’s Cathedral. During the Blitz in World War II, the frontal was removed for safe-keeping, and it remained in storage until recently. The Worshipful Company of Broderers is undertaking the restoration work on the frontal, to mark the centenary of the beginning of the Great War. The frontal will be used for the first time since World War II on August 3, 2014, at St. Paul’s, and then it will hang on display at the cathedral for four years, until the 100th anniversary of the end of the World War I. You can read more about the altar frontal and its history (and perhaps even help trace some of the original embroiderers of the frontal), by visiting the original story published on the St. Paul’s Cathedral website. There, you’ll also find a link to a spreadsheet with all the names of the embroiderers (who came from the UK, Canada, Australia, and South Africa) and the hospitals in which they recovered. They are asking that anyone who recognizes a name on the list contact the Cathedral with the contact information supplied in the original article. You can help spread the word, too, by telling your friends, families, and acquaintances who had family members in the First World War about the project. On the article about the frontal on The History Blog, you’ll find a link to the list in Google Documents, in case you don’t have Excel. 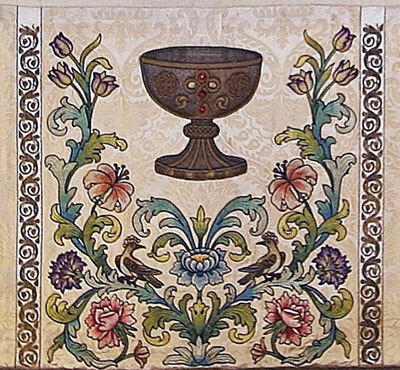 The hands that clung to life in the trenches of the First World War and which lifted the bodies of dead comrades into graves, came home to craft this beautiful altar frontal. It is a symbol of faith despite everything and a deeply moving tribute to those who did not return. This is a wonderful, bittersweet, thought-provoking work of restoration. I would love to see the frontal in person. If you’re in London in August, or traveling there in the next four years, go to St. Paul’s! If I have the opportunity, I sure will. This article is timely to me because yesterday I was watching a documentary on The Great War. The quote by the Precentor of St Paul’s and the work is a contrast between a world of war and a healing craft. I hope many of these men found some healing from this project. It is awesome. The world could possibly be a better place for many by taking up a ‘gentle’ and creative craft. Wow, what an awesome tribute to these men. I’m so glad it will be displayed. Hopefully descendants will get to see their legacy. That terrible First World War history. My grandfather was part of the soldiers, he was still crying even 80 years. These beautifully embroidered panels with grace, finesse, physical pain and moral excesses are exceptional. A hymn to life and to God. 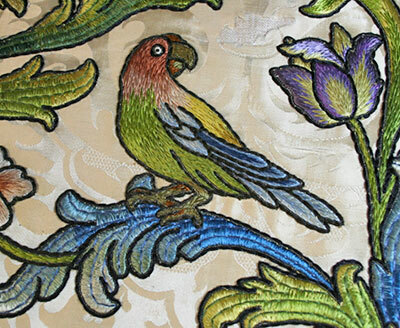 We can observe that the embroidery is an art in itself. Thank you Marie for this tribute to these soldiers. Interesting story, thanks. I wondered why it had been hidden away so long, but the answer was given in the St. Paul’s article. Wow! Thanks for posting this story, truly sad, beautiful and inspirational, all at the same time. Mary, Thank you for finding and publishing this history item regarding the Frontal stitched during World War 1. I too, would love to see it. When I trained as an Occupational Therapist in the 1950s, our training was built on a thorough knowledge of anatomy and medicine plus the ability to do a wide range of crafts and other activities. To this was added the effect on these activities on the physiology and psychology of the patient. This lasted until the 1970s when OT became more focused on abilities and strategies for independence and the adapted equipment that facilitated this. Both have their place in the role of recovery process no matter what the cause. This project would have helped the men regain their equanimity as well as develop fine motor skills. And, it is superbly well stitched. What a beautiful piece of embroidery and a lovely tribute to the courageous men who fought in WW1 and i’m so glad it is going to be displayed and I will definitely go and view it as I live in London, I wish you could have the opportunity Mary of coming to London we could go and see it together. Thanks for sharing this wonderful story with us. Fascinating. As I also have a huge interest in Family History and genealogy, I have posted a link to this on the genealogy forum I am a member of. I really hope they find some descendants. Thank you for your article on the altar frontal at St Paul’s cathedral. I hastened to check the list of names of those who made it thinking that perhaps my grandfather’s would be there. It is not there but I have several treasured pieces of handwork he made while recuperating from wounds he suffered several times in the trenches in France in WWI. I will certainly make sure I get to see it if I am in the UK any time in the next few years. That is a wonderful treasure for sure and a beautiful tribute to the men who worked on it. I love this story too, Mary. How on earth did you come across it? It is wonderful that contrary to popular opinion, some people were giving thought to therapy for so-called shell-shocked soldiers. These days we call it Post Traumatic Stress Disorder and it’s considered almost a by-product of going to war, but back in the early 20th century not much was known about this sort of thing. The embroidery itself is wonderful too – from what I can see in the photographs it looks very competently worked and as someone remarked somewhere it does look as though worked by one hand. I am so pleased to know this story and that the piece will once again see the light of day. Sadly I will not be able to see it in person, but I can imagine it hanging in pride of place in St Paul’s. I clicked through several links. On the St. Paul’s site on the sidebar are two color pictures. Click to enlarge them, and you get good views of the alter frontal. I also went to the site of The Worshipful Company of Broderers. A lot of good information on the history of embroidery/imbroidery/broidery.